Three billion pizzas are sold every year in the United States. Every second, an average of 350 slices are sold. More than 41 percent of us eat pizza every week, with one in eight of all Americans eating pizza on any given day. Roughly 17 percent of all restaurants in the U.S. are pizzerias, with more than 10 percent of the country’s pizzerias located in NYC. How many pizzerias are there? Nearly 70,000, with a quarter of those being Domino’s, Pizza Hut, or Papa John’s. Super Bowl Sunday is the most popular pizza day of the year, with 70 percent of those watching the game eating at least one slice. Like pepperoni? How about 251.7 million pounds of it annually. Most of this consumption is on pizza, and pepperoni accounts for more than a third of all pizza orders. Americans prefer meat toppings to veggie topics at a ratio of roughly two to one. Mozzarella cheese accounts for nearly 80 percent of all Italian-style cheese production in the U.S.
Nearly a third of all people consider pizza to be the perfect breakfast. The pizza industry sells more than $40 billion in product every year. The highest grossing single location, independent pizzeria is the Moose’s Tooth Pub in Anchorage, Alaska. Discover profitable pizza ovens and equipment solutions today. 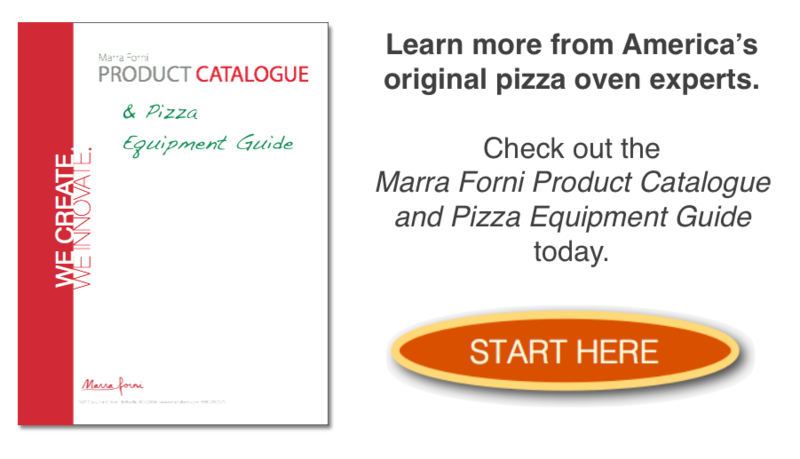 Read the Marra Forni Product Catalogue and Pizza Equipment Guide today. Click below to get started.